Why investing with Scripbox is better than going the direct route? The comparison is not that simple. In a way, the difference is a fee you pay to your doctor, lawyer or CA for their professional advice. Whether you should pay that fee or not depends on the investor's own capability and the quality of service you get. Read on to know more. First, let’s answer some questions that you might have. 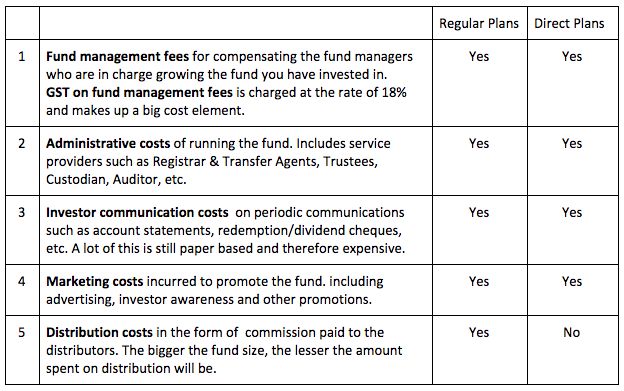 Why is there a difference in cost between direct funds and regular funds? In a regular plan the distribution fee or commission component of cost is included and therefore the total expense is higher. It is important to note that this is indirectly a service fee that you pay to your investment service provider. As a Scripbox customer, how much am I paying in distribution fees? This is the actual difference between the expense ratios of direct and regular plans of the mutual funds which we currently recommend. But I thought it was 1.5% to 2.5% extra in commissions? Yes, we’ve heard that too. But that is more like the “upto 70% off Sale” ads you see. For very few mutual funds the difference approaches 1.5%. Just as for Scripbox recommended funds, the difference tends to be much smaller for better performing funds. In any case, the difference cannot be 2.5% because the total expense ratio itself is in that range (for Scripbox recommended equity funds, as on August 2018, this range is 2.1-2.35%). What do I get for the 0.15% - 0.9% Scripbox gets in distribution fees? We help you identify and focus on your investment objective. We then help you invest in the best way and in the best investments for that objective. We ensure that even one-off costs such as tax on withdrawal and exit loads are as low for you as possible. Scripbox is the only service in India to offer a tax withdrawal algorithm which tells you exactly which funds to withdraw from to minimize taxes. Result - saving in costs of upto 30% of your return. Scripbox is the single point of contact for all your needs for across the fund houses you have invested with through us. Scripbox takes care of the important and time consuming aspects such as helping you change address, nominees, bank accounts, etc across all the mutual funds. The benefit of using our service therefore far exceeds the fee that we earn from you. But, Scripbox gets commissions every year and it will add up to lakhs of rupees over time? True. However, the same math also applies to the value of services you get every year. And since the value you receive exceeds cost every year, the additional benefits also add up to lakhs of rupees over time. Who are direct plans for? You should have a good grasp of the arithmetics of investing (understanding of inflation, compounding and the ability to plan for financial goals). An understanding of the various objectives of investment: for growth, for income and for capital protection. An understanding of portfolio construction principles including diversification. An understanding of the characteristics of different financial product categories - like mutual funds, company deposits, unit linked insurance etc. An ability to select the right option within the category. Time and ability to track your investments both from a performance, exit load and tax perspective, and take informed decisions. The discipline and time to do this regularly over the long term with an understanding of self and the markets’ behaviours. The time to deal with multiple AMCs for any account related issues. Home › Finance Blog › Why investing with Scripbox is better than going the direct route?